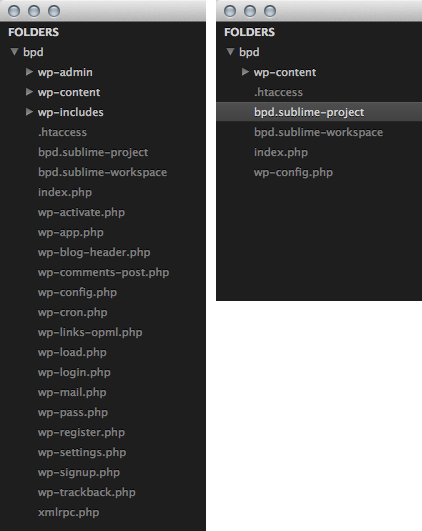 I spend a lot of my time developing WordPress sites in Sublime Text 2. WordPress comes with a bunch of files and directories that I rarely need to touch (wp-includes, wp-admin, wp-cron.php, etc). There is an easy way to hide these files from the Sublime Text sidebar, as illustrated below (left: default, right: hidden files). Of course, you can add and remove directories or files as you require and it doesn’t have to apply to WordPress: you can use this method to hide any directories or files you want. I’ve turned this into a basic TextExpander snippet. Simply copy the path to the clipboard, then type “;sublwp” and you’re done. You can download the snippet here.